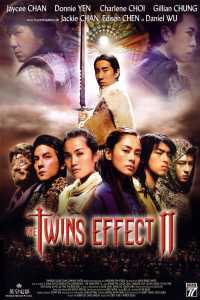 The Twins Effect II is a 2004 Hong Kong action fantasy film directed by Corey Yuen and Patrick Leung. The film is a sequel to The Twins Effect (2003), but has a completely different story from the first film. It starred Charlene Choi and Gillian Chung of Cantopop duo Twins in the leading roles. Co-stars include Donnie Yen, Daniel Wu, Edison Chen, Wilson Chen, Tony Leung Ka-fai, Qu Ying, Fan Bingbing and Jim Chim. Jackie Chan also makes a cameo appearance, along with his son Jaycee Chan who is in his debut. The film’s original English working title was Huadu Chronicles: Blade of Rose and its US DVD release title is Blade of Kings.